Imagine you're at the local coffee shop, hunched over a double-double, your eyes still drooping with sleep. Your friend suddenly elbows you in the ribs to get your attention. Before a curse forms on your lips you see him. Would you like to try my barbarian-sized timbit? He has lean-cut bronze limbs and his hair is a streaming black mane. His blue eyes smolder with an unquenchable fire. A knot of fear and awe forms in your stomach as you watch him approach with a tigerish suppleness. By Crom! You are in the presence of Conan, the Cimmerian. The above description is lifted directly from Robert E. Howard's Conan story "Iron Shadows in the Moon." So, how does one, like Howard, create such a memorable character? According to DYNAMIC CHARACTERS by Nancy Kress first impressions matter. When we first come across a stranger we first tend to first notice what they look like, what they are wearing, how they carry themselves. "So she watched the white man with painful intensity, noting every detail of his appearance. He was tall; neither in height nor in massiveness was he exceeded by many of the giant blacks. He moved with the lithe suppleness of a great panther. When the firelight caught his eyes, they burned like blue fire. High-strapped sandals guarded his feet, and from his broad girdle hung a sword in a leather scabbard." 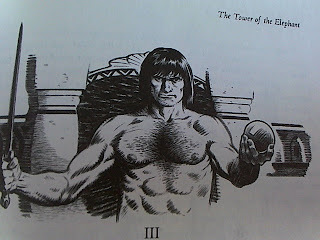 The details Howard chose to describe Conan create immediate visual images. They also give us an idea of Conan's personality. It is no coincidence Howard's creation is reminiscent of a panther stalking emerald jungles. Conan leaps, strikes, and carves his way through life. I highly recommend thinking about characters you loved and taking a closer look at how their creator described them. What specific details did the author use? What images did they conjure? How does the character move or speak? Please feel free to share descriptions of your favorite characters in the comments section below! Remember - the devil is in the details! I agree that character introductions are extremely important. A memorable character is fascinating the moment they enter the page. I've always loved the description of Scarlet O'hara in Gone with the Wind. She definitely was a memorable character.